The passing of David Bowie was sudden and sad. Isn’t it strange that we never really feel the influence of one so great until they are already gone? The outpouring from fans and friends of Bowie seems almost unparalleled to any other superstar of the decade. To create a sort of tribute to him seems a little daunting, given that he has influenced everything from pop culture, to music to civil rights. So, staying in true form to this fashion publication, we have decided to celebrate and recognize all of the ways Bowie influenced the world of fashion – and how, through that influence, he has been able to teach a generation of fashionable underdogs how to shine. Why is Bowie such an important figure in the history of fashion? Bowie found fame with his second album “Space Oddity,” while also simultaneously creating his first persona “Major Tom,” and we got our first glimpse into the wonderfully weird. Before he came along in the early ‘70s, fashion was just beginning to evolve into something less for the masses and more for the individual. His long hair and makeup pushed the limits of androgyny and mainstream culture. Here was a man who at one time could be gender fluid, dancing around stages wearing colorful jumpsuits with chunky boots, while the next moment could be wearing a traditional men’s blazer for an interview or a walk around the block. Perhaps the most famous of his personas was Ziggy Stardust, who bore an uncanny resemblance to your friendly leather pantsuit wearing neighborhood alien. Throughout the ‘70s, Ziggy Stardust became a larger than life pop star who hung out around equally cool fashion icons like Elizabeth Taylor, Lou Reed and Paul McCartney. He was also married to one of the coolest fashion icons, the model Iman Abdulmajid, and let me tell you – they are the real relationship goals. 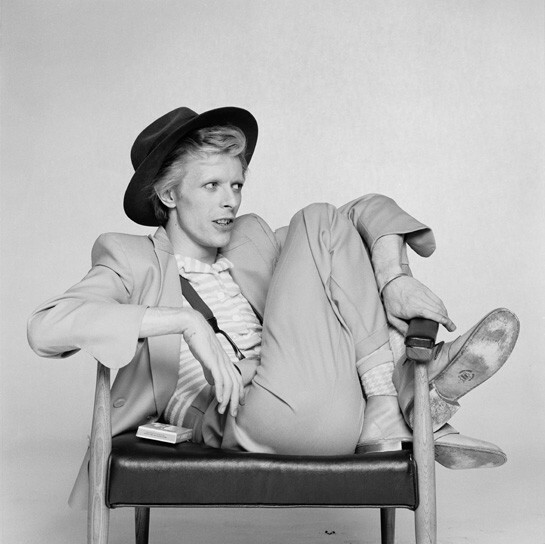 Even after Bowie had killed off his character Ziggy, he remained an envy with his white suits and classic swagger. In the ‘80s, he still killed it with pastel suits and leather jackets. Later on in his career, he leaned back into his mystery a bit and stuck to a more minimalistic look. So, in honor of this fashionable legend, here is a look at some of his most memorable looks throughout the years.